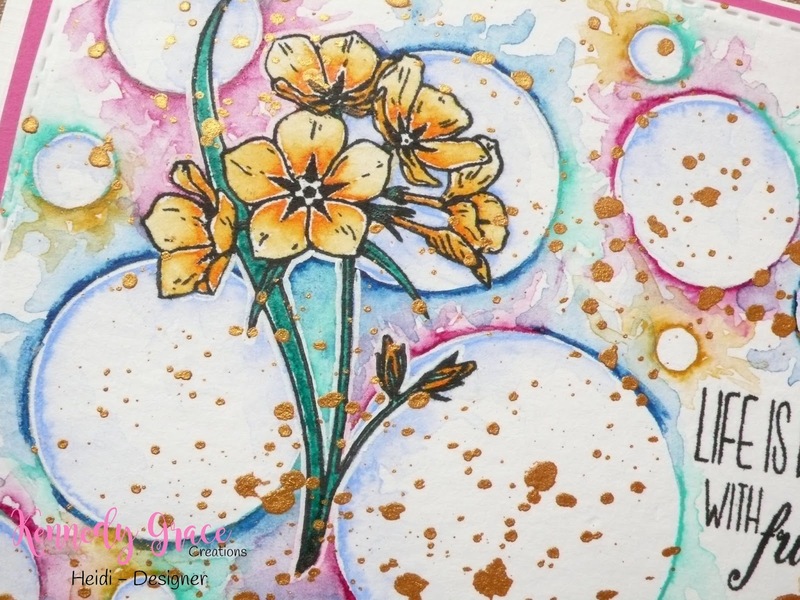 If you feel this card looks difficult to make, it’s not, I will share a link to a video where you can see how you create these circles and how you apply the watercolour and that’s all there is to it. The only thing I did different is that I also used watercolour on the inside of the circles, but you can created whatever you like, give it your own personal touch! So, to get this card started I die cut a stitched rectangle panel with one of my nesting dies from some Cornwall Aquarel paper (Grain Fin, bright white) and stamped one of the flowers in the Kennedy Grace Creations “Grace’s Little Note” stamp set on there with some Versafine “Onyx Black” ink and using my MISTI stamping tool (this aquarel paper is fairly smooth but to get even black lines I needed to ink up my stamp several times). 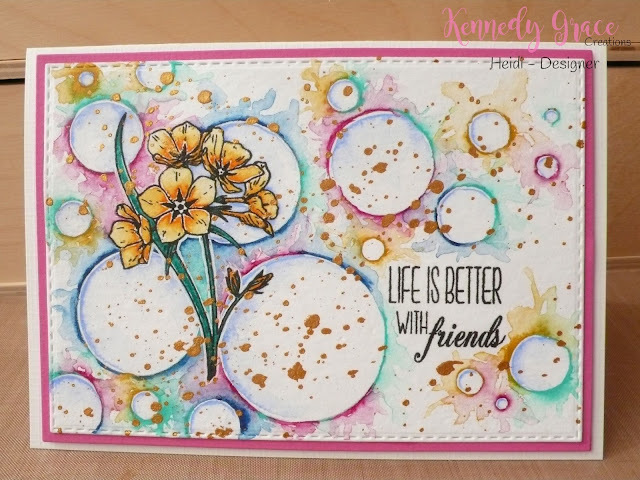 I did the same with one of the sentiments from the Kennedy Grace Creations “Sunflower” stamp set. I stamped the sentiment before I started water colouring so that I knew what area to spare when drawing the circles. After the stamping was done I started drawing the circles with a regular graphite pencil: make thin lines, and if you find it difficult to draw them by hand you can use something small to trace around or use a pair of compasses, in that case don’t press to hard on the point that creates a hole in the paper. Next you can start water colouring: I used my Gansai Tambi 36 watercolour set, water and a regular brush, using the following colours: for the background 61 / 50 / 44 / 37 and 66, and for the flower 33 and 55. After the watercolour was dry I splattered on some FineTec Pearl Color in “Inka Gold” after covering up the sentiment and the main part of the flower with some Post It notes. And to finish this card I die cut a slightly larger rectangle panel from some matching pink card stock, gluing both rectangles together with liquid glue and adhering these combined panels to a crème coloured linen textured card base with one millimetre thick foam tape. And that’s it for today’s artsy card! Let me know if you’re going to try this technique, I would love to hear! In the meantime I wish everyone a creative day.